I'm not one for making the same meals every week - or even every month. 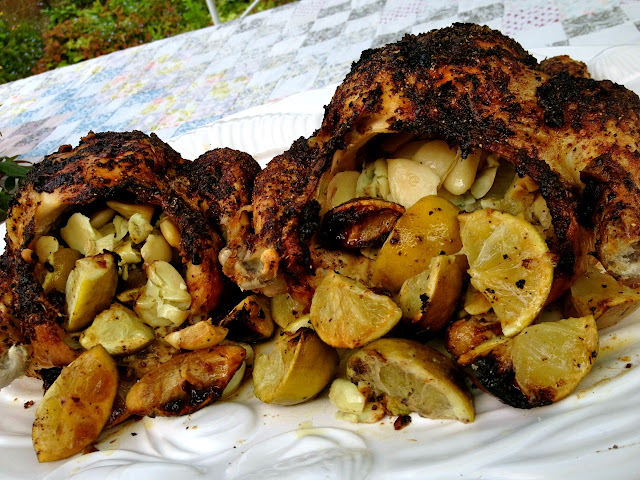 The single exception is this fall-off-the-bone, roasted chicken, headily infused with garlic and lime. Rarely a week goes by, without my kitchen filled with the fragrance of roasting chicken, garlic and limes. Usually, I make this on a Sunday afternoon so that I can use the chicken in all sorts of work night meals. These succulent, flavourful birds will spoil you for all other chicken. I prefer using small birds because I find them tastier, with a silkier texture. Also, because I always make roast chicken stock, with the leftovers, I like having a lot of bones to slow cook. The presentation, too, is more inspiring. A platter with three chickens, even small ones, makes a more bountiful statement than one, or two, larger birds. And with six options for legs, wings, thighs, and breast, everybody gets their favourite part of the bird - even if that everybody happens to be you alone. Besides making a rich, brown stock, use leftover chicken in enchiladas, tacos, chili, pasta, salads, sandwiches, and soups. You won’t find a more versatile meat, especially when cooked this way. 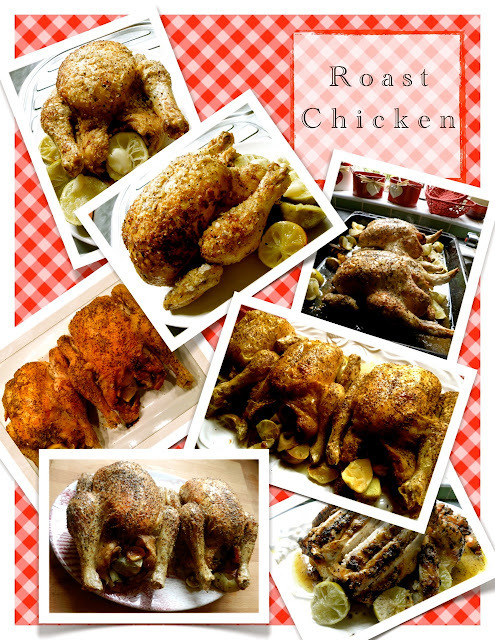 Remove chicken from fridge an hour, or two, before roasting. Melt butter in small saucepan over low heat. While butter melts, get to work separating and peeling all that garlic. Add half the peeled cloves to the melted butter pan. Put the other half in a large bowl. Pour garlic butter into blender and chop for about a minute. Pour into spouted measuring jug and set aside. 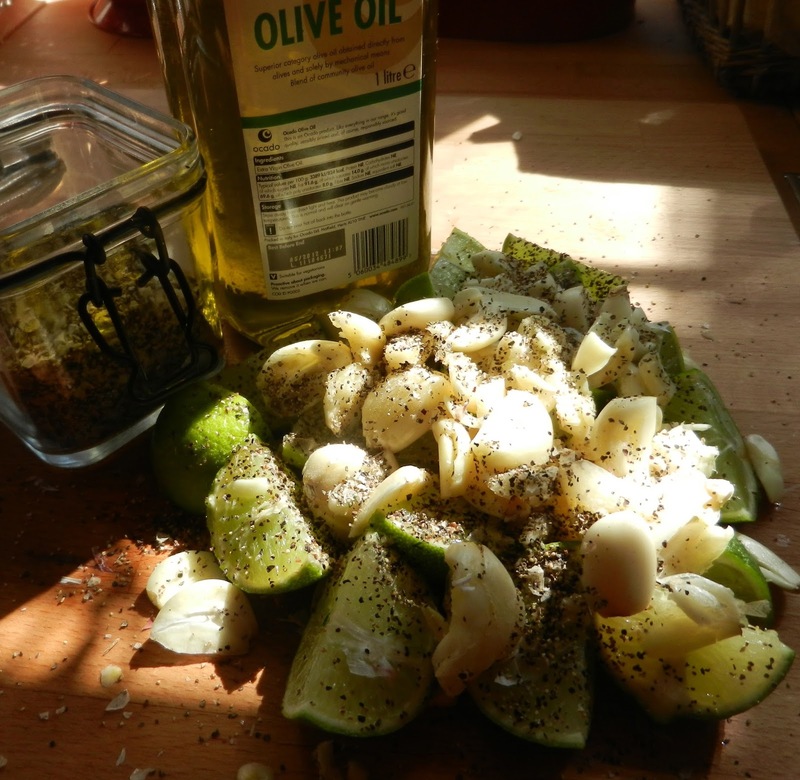 Wash and cut limes into quarters, combine with garlic in bowl (not the garlic butter) Set aside. In small bowl, combine coarse salt and pepper with chili flakes. Add 2 tbs of salt/pepper/chili mixture to garlic and limes. Mix well. Place all three chickens on large baking tray. Put 1 tbs of seasoned garlic butter in each chicken. Stuff chickens with seasoned garlic and limes. Don’t be afraid to really pack them. Combine the remaining seasoning with the garlic butter. Stir in olive oil. Using hands, starting with bottom of the chickens (turned breast side down) pour a little seasoned garlic butter onto the chicken and thoroughly coat, completely covering back, wings, legs, etc . . . When the bottom surface is well covered, turn chicken over and repeat the process with the breast side, ensuring all the skin is well anointed in garlic butter. Roast chickens, breast side up, in hot oven for about 100 minutes, basting once with drippings halfway through roasting. To make sure chickens are completely cooked, wiggle a drumstick. If it moves freely, it's likely done. You can also test for doneness by inserting a skewer into the thigh portion of the leg. If the juices run clear, it’s cooked through. If not, continue cooking another ten minutes and test again. Remove chickens from oven. Allow to rest 15 - 20 minutes before serving. 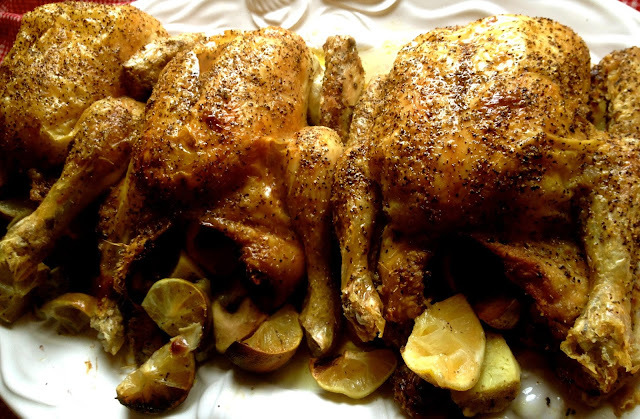 Serve Henry VIII style, bringing a large platter of roasted birds to the table. Squeeze limes, by now artfully spilling out of the well-stuffed cavity, over the birds. Serve drippings on the side from spouted server, or also pour over birds table side. Orson Wells was said to have enjoyed four roasted chickens at a sitting. Mr. Wells was my kind of man. My favourite accompaniment to roast chicken is mashed potatoes and whatever green, seasonal vegetable I have to hand. Because of the big flavour of the birds, I like pairing them with steamed kale in autumn and winter, asparagus in spring, and green beans, with toasted slivered almonds in summer. Other excellent choices are sweet potatoes or butternut squash. As for beverages, a cold glass of Chablis is always perfect with this meal. A dry cider compliments as well. And of course, sparkling water, in my book, goes with everything. Every roast chicken is destined to become soup at Lovers Kitchen. 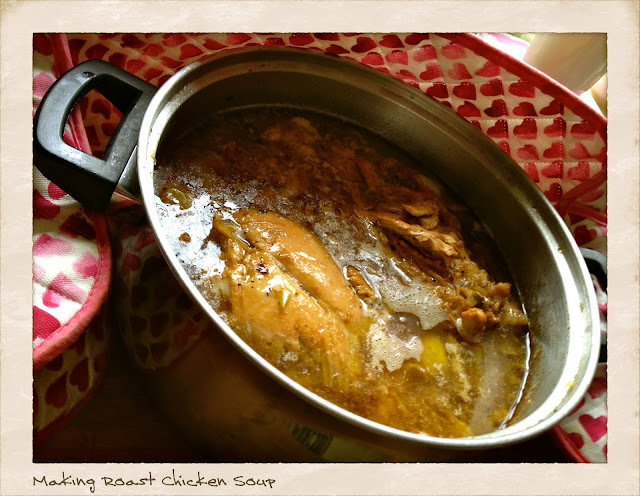 This is the richest chicken soup you will ever make. If you don’t fancy soup in warmer weather, make the stock and freeze it for things like risotto, sauces, and gravy. Homemade chicken stock is a kitchen essential - chez vous. After you’ve had your fill of roast chicken, put the carcass, leftover meat, and garlic into a large stockpot. Squeeze out the very last juice of any remaining limes, including the pulp - but not the seeds. Add very hot water to the roasting pan and stir with spatula, lifting the tasty brown bits from bottom of pan. Pour the watery drippings into stockpot. Do this a couple of times until the carcass is more than half covered. From here, you can either refrigerate everything until the next day (this is what I do) or continue making your soup. 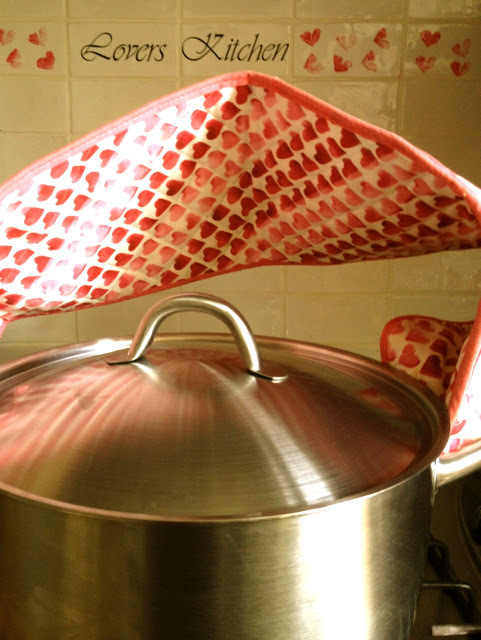 Place stockpot on stove over low heat. Add enough water to cover chicken carcass. Slowly simmer, on low heat, for four hours. Check every hour and top up with water as required. You probably won’t need any other seasoning, but if you do, you can add it later. 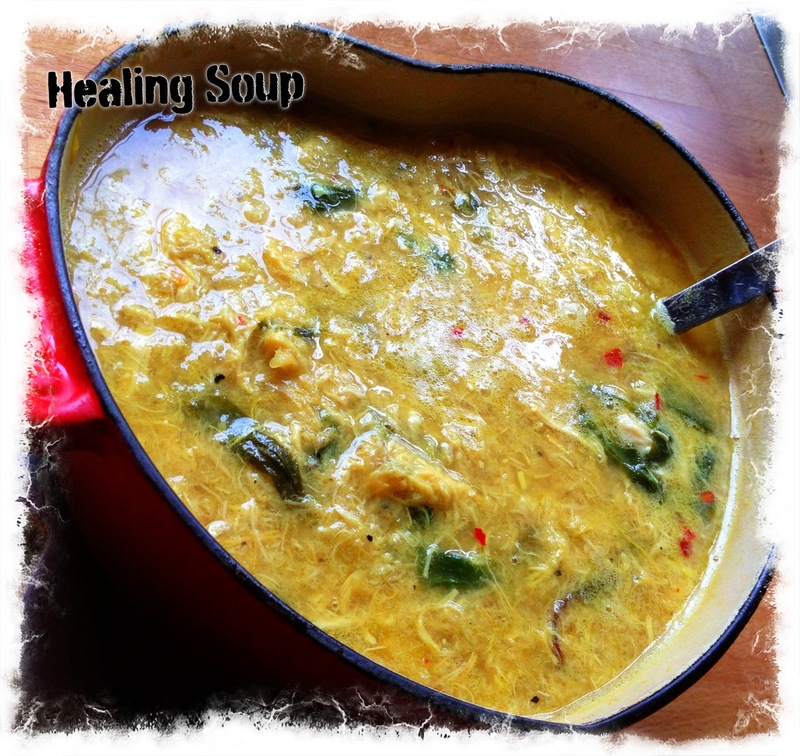 Allow soup to cool in pot. This can take a couple of hours. Then, placing a big colander into a second stockpot, or very large bowl, gently pour the soup, bones and all, into the colander, so that the second pot catches every drop of the delectable broth. Get out a couple more bowls to collect the bones and meat. Pick through the bones, removing all the meat, which will come apart easily in your hands. You can add the meat back into the soup pot, or save it separately for other dishes. Toss out the bones. Refrigerate the broth (with, or without chicken) for several hours. When cold, skim the waxy layer of fat off the top and discard, or set aside the schmaltz (Yiddish for chicken fat) for making dumplings, or matzo balls, to add to your soup. 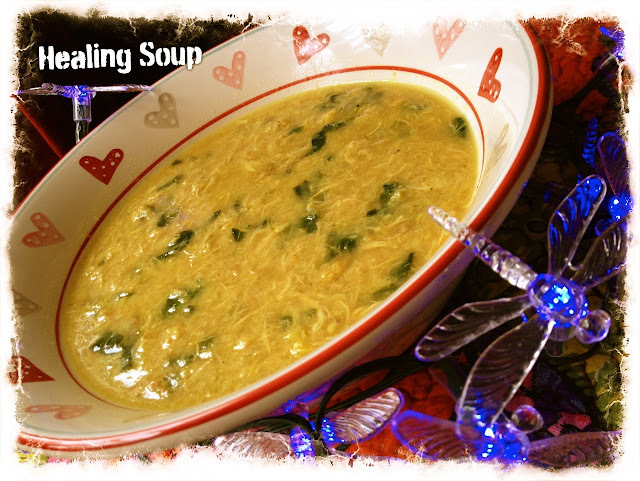 Eat the soup within a couple of days, or freeze it for later. I often add a couple handfuls of dark greens (like baby spinach, or chopped kale) to my soup and serve it over tortellini, or mashed potatoes. Try it with dumplings or matzo balls. Crispy Parmesan bread sticks are good too. Best of all is a chicken dip sandwich: Fill toasted baguette with chicken and dip each bite into a warm bowl of broth. Mmmmm. Best thing you'll eat all week.